Anthony Saich, who serves as faculty chair of Harvard Kennedy School’s China program, said the positive assessment the Chinese have of Xi’s performance — both at home and abroad — is explained by a multitude of factors. “One is that they don’t hear much negative news about their national government; it’s all positive,” he explained. Here in the United States, many people have become almost oblivious to the daily drumbeat of opinion pollsters declaring what the public thinks about political candidates and leaders. But how people in other countries view their heads of state, and those of other major nations, is terrain that’s not nearly as well-mapped. 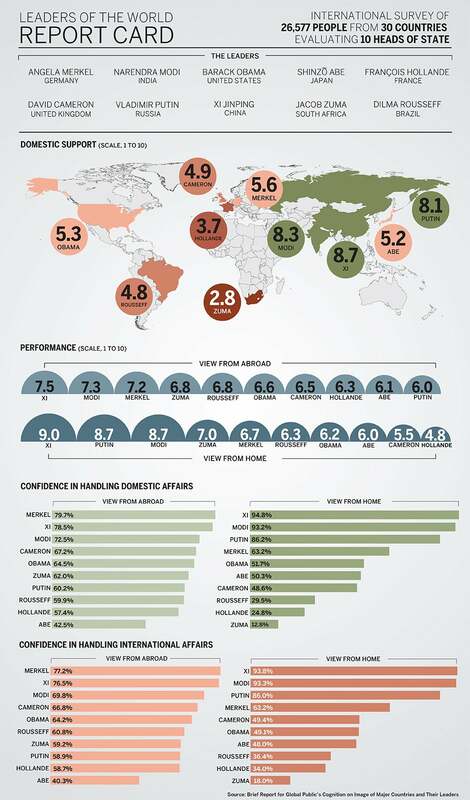 In a rare poll, citizens on five continents and in 30 countries, including China, were asked to identify and evaluate the job performance of 10 of the most widely recognized global leaders, including Chinese President Xi Jinping, Russian President Vladimir Putin, German Chancellor Angela Merkel, and U.S. President Barack Obama. The survey of more than 26,000 respondents, conducted this fall by GMO Research, a Tokyo-based global market research firm, rated Xi, Indian Prime Minister Narendra Modi, and Merkel the top-performing world leaders, with respective scores of 7.5, 7.3, and 7.2 on a scale of one to 10. They ranked French President François Hollande (6.3), Japanese Prime Minister Shinzō Abe (6.1), and Putin (6.0) at the bottom. Obama (6.6) received middling marks, just ahead of David Cameron (6.5), the British prime minister. Respondents in India (87.8 percent), Russia (79.6 percent), and China (78.6 percent) overwhelmingly said that their home country was moving in the right direction, while only a minority in the United States (44.8 percent), Japan (30.4 percent), and South Africa (29.3 percent) felt their nation was making progress. “It maps pretty closely to geopolitics,” said Anthony Saich, the Daewoo Professor of International Affairs and director of the Ash Center for Democratic Governance and Innovation at Harvard Kennedy School (HKS), which co-sponsored the study. In countries where a single party dominates, or where public debate about political leaders is constrained, citizens typically rated their own officials much higher than did respondents in nations with a multiparty system and a more open and robust press, Saich wrote in a just-published analysis of the survey findings. Saich, who serves as faculty chair of HKS’s China program, said granular data about how Chinese citizens viewed other world leaders was groundbreaking and supports what was generally known already. Their positive assessment of Xi’s performance both at home and abroad is explained by a multitude of factors. “One is that they don’t hear much negative news about their national government; it’s all positive. And the national government is always making great pronouncements: ‘We’re going to give you more health benefits, we’re going to give you more minimum living standards, support benefits, and so forth,’” he said. “But it’s the local government that has to find the money to provide all those services. So from their perspective, the center is doing good things: Why isn’t the local government actually carrying this out? Well, one of the reasons is because the central government doesn’t give them the money to do it. The results provide a preliminary but useful baseline for similarly broad surveys and analyses to build on in the future, said Saich. He planned to meet with the polling firm in Beijing to discuss more potential collaborations that could enhance public understanding of contemporary political dynamics. “Paltering is when a communicator says truthful things and in the process knowingly leads the listener to a false conclusion. It has the same effect as lying, but it allows the communicator to say truthful things and, some of our studies suggest, feel like they’re not being as deceptive as liars,” said Todd Rogers, a behavioral scientist at Harvard Kennedy School who co-authored a paper with researchers from Harvard Business School and the Wharton School.